7,700,000 died from disease. Deaths in military confrontation unknown. Illustration of a typical conquistador. The Spanish conquest of the Inca Empire was one of the most important campaigns in the Spanish colonization of the Americas. After years of preliminary exploration and military skirmishes, 168 Spanish soldiers under conquistador Francisco Pizarro, his brothers, and their native allies captured the Sapa Inca Atahualpa in the 1532 Battle of Cajamarca. It was the first step in a long campaign that took decades of fighting but ended in Spanish victory in 1572 and colonization of the region as the Viceroyalty of Peru. The conquest of the Inca Empire (called "Tahuantinsuyu" or "Tawantinsuyu" in Quechua, meaning "Realm of the Four Parts"), led to spin-off campaigns into present-day Chile and Colombia, as well as expeditions towards the Amazon Basin. When the Spanish arrived at the borders of the Inca Empire in 1528, it spanned a considerable area and was by far the largest of the four grand pre-Columbian civilizations. Extending southward from the Ancomayo, which is now known as the Patía River, in southern present-day Colombia to the Maule River in what would later be known as Chile, and eastward from the Pacific Ocean to the edge of the Amazonian jungles, the empire covered some of the most mountainous terrain on Earth. In less than a century, the Inca had expanded their empire from about 400,000 km2 (150,000 sq mi) in 1448 to 1,800,000 km2 (690,000 sq mi) in 1528, just before the arrival of the Spanish. This vast area of land varied greatly in cultures and in climate. Because of the diverse cultures and geography, the Inca allowed many areas of the empire to be governed under the control of local leaders, who were watched and monitored by Inca officials. However, under the administrative mechanisms established by the Inca, all parts of the empire answered to, and were ultimately under the direct control of, the Emperor. Scholars estimate that the population of the Inca Empire numbered more than 16,000,000. Some scholars, such as Jared Diamond, believe that while the Spanish conquest was undoubtedly the proximate cause of the collapse of the Inca Empire, it may very well have been past its peak and already in the process of decline. In 1528, Emperor Huayna Capac ruled the Inca Empire. He could trace his lineage back to a "stranger king" named Manco Cápac, the mythical founder of the Inca clan,:144 who according to tradition emerged from a cave in a region called Paqariq Tampu. Huayna Capac was the son of the previous ruler, Túpac Inca, and the grandson of Pachacuti, the Emperor who, by conquest, had commenced the dramatic expansion of the Inca Empire from its cultural and traditional base in the area around Cusco. On his accession to the throne, Huayna Capac had continued the policy of expansion by conquest, taking Inca armies north into what is today Ecuador. :98 While he had to put down a number of rebellions during his reign, by the time of his death, his legitimacy was as unquestioned as was the primacy of Inca power. However, expansion had resulted in its own problems. Many parts of the empire maintained distinctive cultures and these were at best resistive participants in the imperial project. The large extent of the empire, the extremely difficult terrain of much of it, and the fact that all communication and travel had to take place on foot or by boat, seems to have caused increasing difficulty in the Incas' effective administration of the empire. Huayna Capac relied on his sons to support his reign. While he had many legitimate and illegitimate children (legitimate meaning born of his sister-wife, under the Inca system), two sons are historically important. Prince Túpac Cusi Hualpa, also known as Huáscar, was the son of Coya Mama Rahua Occllo of the royal line. The second was Atahualpa, an illegitimate son who was likely born of a daughter of the last independent King of Quitu, one of the states conquered by Huayna Capac during the expansion of the Inca Empire. These two sons would play pivotal roles in the final years of the Inca Empire. The Spanish conquistador Pizarro and his men were greatly aided in their enterprise by invading when the Inca Empire was in the midst of a war of succession between the princes Huáscar and Atahualpa. :143 Atahualpa seems to have spent more time with Huayna Capac during the years when he was in the north with the army conquering Ecuador. Atahualpa was thus closer to, and had better relations with the army and its leading generals. When both Huayna Capac and his eldest son and designated heir, Ninan Cuyochic, died suddenly in 1528 from what was probably smallpox, a disease introduced by the Spanish into the Americas, the question of who would succeed as emperor was thrown open. Huayna had died before he could nominate the new heir. 1544 – Manco Inca is murdered by supporters of Diego de Almagro. The Inca do not stop their revolt. The civil war between Atahualpa and Huascar weakened the empire immediately prior to its struggle with the Spanish. Historians are unsure of whether a united Inca Empire could have defeated the Spanish in the long term due to factors such as the high mortality from disease and its related social disruption, and the superior military technology of the conquistadors, who possessed horses, dogs, metal armor, swords, cannons, and primitive, but effective, firearms. Atahualpa appeared to be more popular with the people than his brother, and he was certainly more valued by the army, the core of which was based in the recently conquered northern province of Quitu. At the outset of the conflict, each brother controlled his respective domains, with Atahualpa secure in the north, and Huáscar controlling the capital of Cuzco and the large territory to the south, including the area around Lake Titicaca. This region had supplied large numbers of troops for Huáscar's forces. After a period of diplomatic posturing and jockeying for position, open warfare broke out. Huáscar seemed poised to bring the war to a rapid conclusion, as troops loyal to him took Atahualpa prisoner, while he was attending a festival in the city of Tumibamba. However, Atahualpa quickly escaped and returned to Quitu. There, he was able to amass what is estimated to be at least 30,000 soldiers. While Huáscar managed to muster about the same number of soldiers, they were less experienced. Atahualpa sent his forces south under the command of two of his leading generals, Challcuchima and Quisquis, who won an uninterrupted series of victories that soon brought them to the very gates of Cuzco. On the first day of the battle for Cuzco, the forces loyal to Huáscar gained an early advantage. However, on the second day, Huáscar personally led an ill-advised "surprise" attack, of which the generals Challcuchima and Quisquis had advance knowledge. In the ensuing battle, Huáscar was captured, and resistance completely collapsed. The victorious generals sent word north by chasqui messenger to Atahualpa, who had moved south from Quitu to the royal resort springs outside Cajamarca. The messenger arrived with news of the final victory on the same day that Pizarro and his small band of adventurers, together with some indigenous allies, descended from the Andes into the town of Cajamarca. Here, Panama and its poverty. According to historian Raúl Porras Barrenechea, Peru is not a Quechuan nor Caribbean word, but Indo-Hispanic or hybrid. Unknown to Pizarro, as he was lobbying for permission to mount an expedition, his proposed enemy was being devastated by the diseases brought to the American continents during earlier Spanish contacts. When Pizarro arrived in Peru in 1532, he found it vastly different from when he had been there just five years before. Amid the ruins of the city of Tumbes, he tried to piece together the situation before him. From two young local boys whom he had taught how to speak Spanish in order to translate for him, Pizarro learned of the civil war and of the disease that was destroying the Inca Empire. When first spotted by the natives, Pizarro and his men were thought to be viracocha cuna or "gods". The Natives described Pizarro's men to the Inca. They said that capito was tall with a full beard and was completely wrapped in clothing. The Natives described the men's swords and how they killed sheep with them. The men did not eat human flesh, but rather sheep, lamb, duck, pigeons, and deer, and cooked the meat. Atahualpa was fearful of what the white men were capable of. If they were runa quicachac or "destroyers of peoples," then he should flee. If they were viracocha cuna runa allichac or "gods who are benefactors of the people," then he should not flee, but welcome them. The messengers went back to Tangarala, and Atahualpa sent Cinquinchara, an Orejon warrior, to the Spanish to serve as an interpreter. After traveling with the Spanish, Cinquinchara returned to Atahualpa; they discussed whether or not the Spanish men were gods. Cinquinchara decided they were men because he saw them eat, drink, dress, and have relations with women. He saw them produce no miracles. Cinquinchara informed Atahualpa that they were small in number, about 170–180 men, and had bound the Native captives with "iron ropes". When Atahualpa asked what to do about the strangers, Cinquinchara said that they should be killed because they were evil thieves who took whatever they wanted, and were supai cuna or "devils". He recommended trapping the men inside of their sleeping quarters and burning them to death. "lay the foundation of concord, brotherhood, and perpetual peace that should exist between us, so that you may receive us under your protection and hear the divine law from us and all your people may learn and receive it, for it will be the greatest honor, advantage, and salvation to them all." Atahualpa responded only after Hernando Pizarro arrived. He replied with what he had heard from his scouts, saying that Pizarro and his men were killing and enslaving countless numbers on the coast. Pizarro denied the report and Atahualpa, with limited information, reluctantly let the matter go. At the end of their meeting, the men agreed to meet the next day at Cajamarca. After his victory and the death of his brother Huáscar, Atahualpa was fasting in the Inca baths outside Cajamarca. Pizarro and his men reached that city on 15 November 1532. The friar urged attack, starting the Battle of Cajamarca on 16 November 1532. Though the historical accounts relating to these circumstances vary, the true Spanish motives for the attack seemed to be a desire for loot and flat-out impatience. The Inca likely did not adequately understand the conquistadors' demands. The majority of Atahualpa's troops were in the Cuzco region along with Quisquis and Challcuchima, the two generals he trusted the most. This was a major disadvantage for the Inca. Their undoing also resulted from a lack of self-confidence, and a desire to make public demonstration of fearlessness and godlike command of situation. The main view is that the Inca were eventually defeated due to inferior weapons, 'open battle' tactics, disease, internal unrest, the bold tactics of the Spanish, and the capture of their emperor. While Spanish armour was very effective against most of the Andean weapons, it was not impenetrable to maces, clubs, or slings. However, ensuing hostilities such as the Mixtón Rebellion, Chichimeca War, and Arauco War would require that the conquistadors ally with friendly tribes in these later expeditions. The battle began with a shot from a cannon and the battle cry "Santiago!" Many of the guns used by the Spaniards were hard to use in the frequent close-combat situations. Most natives adapted in 'guerrilla fashion' by only shooting at the legs of the conquistadors if they happened to be unarmored. During Atahualpa's captivity, the Spanish, although greatly outnumbered, forced him to order his generals to back down by threatening to kill him if he did not. According to the Spanish envoy's demands, Atahualpa offered to fill a large room with gold and promised the Spanish twice that amount in silver. While Pizarro ostensibly accepted this offer and allowed the gold to pile up, he had no intention of releasing the Inca; he needed Atahualpa's influence over his generals and the people in order to maintain the peace. Pizarro held Atahualpa for a ransom of gold and silver; the treasure began to be delivered from Cuzco on 20 December 1532 and flowed steadily from then on. By 3 May 1533 Pizarro received all the treasure he had requested; it was melted, refined, and made into bars. The question eventually came up of what to do with Atahualpa; both Pizarro and Soto were against killing him, but the other Spaniards were loud in their demands for death. False interpretations from the interpreter Felipillo made the Spaniards paranoid. They were told that Atahualpa had ordered secret attacks and his warriors were hidden in the surrounding area. Soto went with a small army to look for the hidden army, but a trial for Atahualpa was held in his absence. Among the charges were polygamy, incestuous marriage, and idolatry, all frowned upon in Catholicism but common in Inca culture and religion. The men who were against Atahualpa's conviction and murder argued that he should be judged by King Charles since he was the sovereign prince. Atahualpa agreed to accept baptism to avoid being burned at the stake and in the hopes of one day rejoining his army and killing the Spanish; he was baptized as Francisco. On 29 August 1533 Atahualpa was garrotted and died a Christian. He was buried with Christian rites in the church of San Francisco at Cajamarca, but was soon disinterred. His body was taken, probably at his prior request, to its final resting place in Quito. Upon de Soto's return, he was furious; he had found no evidence of any secret gathering of Atahualpa's warriors. Archaeological evidence of the rebellion incident exists. The remains of about 70 men, women, and adolescents were found in the path of a planned expressway near Lima in 2007. Forensic evidence suggests that the natives were killed by European weapons, probably during the uprising in 1536. When it became clear that defeat was imminent, Manco Inca retreated further to the mountainous region:259 of Vilcabamba and established the small Neo-Inca State, where Manco Inca and his successors continued to hold some power for several more decades. His son, Túpac Amaru, was the last Inca. After deadly confrontations, he was murdered by the Spanish in 1572. In total, the conquest took about forty years to complete. Many Inca attempts to regain the empire had occurred, but none had been successful. Thus the Spanish conquest was achieved through relentless force, and deception, aided by factors like smallpox and a great communication and cultural divide. The Spaniards destroyed much of the Incan culture and introduced the Spanish culture to the native population. A struggle for power resulted in a long civil war between Francisco Pizarro and Diego de Almagro in which Almagro was killed. Almagro's loyal followers and his descendants later avenged his death by killing Pizarro in 1541. This was done inside the palace of Francisco Pizarro in a fight to the death by these assassins, most of which were former soldiers of Diego de Almagro who were stripped of title and belongings after his death. Despite the war, the Spaniards did not neglect the colonizing process. Spanish royal authority on these territories was consolidated by the creation of an Audiencia Real, a type of appellate court. In January 1535, Lima was founded, from which the political and administrative institutions were to be organized. In 1542, the Spanish created the Viceroyalty of New Castile, that shortly after would be called Viceroyalty of Peru. Nevertheless, the Viceroyalty of Peru was not organized until the arrival of a later Viceroy Francisco de Toledo in 1572. Toledo ended the indigenous Neo-Inca State in Vilcabamba, executing the Inca Túpac Amaru. He promoted economic development using commercial monopoly and built up the extraction from the silver mines of Potosí, using slavery based on the Inca institution of forced labor for mandatory public service called mita. The integration of Spanish culture into Peru was carried out not only by Pizarro and his other captains, but also by the many Spanish who also came to Peru to exploit its riches and inhabit its land. These included many different kinds of immigrants such as Spanish merchants, peasants, artisans, and Spanish women. Another element that the Spanish brought with them were African slaves to work alongside captive Incas for use in labor with things such as agriculture and mining for silver. These people all brought with them their own pieces of Spanish culture to integrate into Peruvian society. The arrival of the Spanish also had an unexpected impact on the land itself, recent research points out that Spanish conquest of the Inca altered Peru’s shoreline. Before the Spaniards arrived, inhabitants of the arid northern Peruvian coast clad massive sand dune–like ridges with a -likely- accidental form of “armor”, millions of discarded mollusk shells, which protected the ridges from erosion for nearly 4700 years prior to the Spanish arrival, and produced a vast corrugated landscape that is visible from space. This incidental landscape protection came to a swift end, however, after diseases brought by Spanish colonists decimated the local population and after colonial officials resettled the survivors inland, without humans to create the protective covering, newly formed beach ridges simply eroded and vanished. Acording to Archaeologist Torben Rick, parts of the northern coast of Peru may look completely natural and pristine, “but if you rewind the clock a couple of millennia, you see that people were actively shaping this land by creating beach ridge systems". 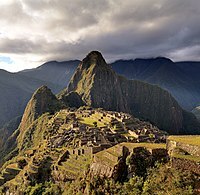 Almost nothing was left of the Inca civilizations after the conquest by the Spanish, as culture was not as significant as gold to the new conquerors. The unique indigenous road and communications systems were essentially lost. The only things that persisted of the original culture are the very few artifacts that remained and the minute cultural aspects, such as language, that was left behind by the small percentage of Incas who persisted. The long-term effects of the arrival of the Spanish on the population of South America were simply catastrophic. While this is the case for every group of Native-Americans that encountered Europeans from the fifteenth century onwards, the Incan population suffered a dramatic and quick decline following contact. It is estimated that parts of the empire, notably the Central Andes, suffered a population decline ratio of 58:1 during the years of 1520–1571. The single greatest cause of the decimation of native populations was infectious disease. Old World Eurasian diseases, which had long been endemic on the Continent, were carried unknowingly by colonists and conquistadors. As these were new to the natives, they had no acquired immunity and suffered very high rates of death. More died of disease than any army or armed conflict. As the Inca did not have as strong a writing tradition as the Aztec or Maya, it is difficult for historians to estimate population decline or any events after conquest. But, it is apparent that the Inca began to contract the diseases several years before the Spanish appeared in the region, as it was likely carried to their empire by traders and travelers. The outbreak, believed to be hemorrhagic smallpox, reached the Andes in 1524. While numbers are unavailable, Spanish records indicate that the population was so devastated by disease that they could hardly resist the foreign forces. Historians differ as to whether the illness of the 1520s was smallpox; a minority of scholars claim that the epidemic was due to an indigenous illness called Carrion's disease. In any case, a 1981 study by N. D. Cook the shows that the Andes suffered from three separate population declines during colonization. The first was of 30–50 percent during the first outbreak of smallpox. When a measles outbreak occurred, there was another decline of 25–30 percent. Finally, when smallpox and measles epidemics occurred together, which occurred from 1585 to 1591, a decline of 30–60 percent occurred. Collectively these declines amounted to a decline of 93 percent from the pre-contact population in the Andes region. Mortality was particularly high among children, ensuring that the impact of the epidemics would extend to the next generation. Beyond the devastation of the local populations by disease, they suffered considerable enslavement, pillaging and destruction from warfare. The Spanish took thousands of women from the local natives to use as servants and concubines. 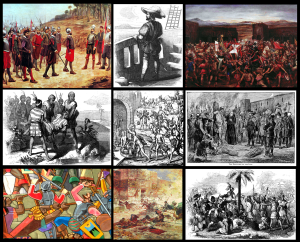 As Pizarro and his men took over portions of South America, they plundered and enslaved countless people. Some local populations entered into vassalage willingly, to defeat the Inca. Native groups such as the Huanca, Cañari and Chachapoya fought alongside the Spanish as they opposed Inca rule. The basic policy of the Spanish towards local populations was that voluntary vassalage would yield safety and coexistence, while continued resistance would result in more deaths and destruction. Another significant effect on the people in South America was the spread of Christianity. As Pizarro and the Spanish subdued the continent and brought it under their control, they forcefully converted many to Christianity, claiming to have educated them in the ways of the "one true religion." With the depopulation of the local populations along with the capitulation of the Inca Empire, the Spanish missionary work after colonization began was able to continue unimpeded. It took just a generation for the entire continent to be under Christian influence. Peter Shaffer's play The Royal Hunt of the Sun (1964) dramatizes the conquest of the Incas. In the play, Pizarro, Atahualpa, Valverde and other historical figures appear as characters. Matthew Reilly's novel Temple, is set at the siege of Cuzco. Many historical figures are mentioned, and a (fictional) brother of Pizarro is noted to be in pursuit of the protagonist. The conquest is also used as a "starting point of the cat." The Inca are featured in the third Campaign in Age of Empires 3, having a Lost City hidden in the Andes. They are also in the Multiplayer, found primarily in the areas making up Chile and Argentina. The conquest is parodied in The Simpsons TV series, in the episode "Lost Verizon", written by John Frink. Pizarro and his fellow conquistadors feature as antagonists in the 1982 animated serial The Mysterious Cities of Gold. I wish Your Majesty to understand the motive that moves me to make this statement is the peace of my conscience and because of the guilt I share. For we have destroyed by our evil behaviour such a government as was enjoyed by these natives. They were so free of crime and greed, both men and women, that they could leave gold or silver worth a hundred thousand pesos in their open house. So that when they discovered that we were thieves and men who sought to force their wives and daughters to commit sin with them, they despised us. But now things have come to such a pass in offence of God, owing to the bad example we have set them in all things, that these natives from doing no evil have turned into people who can do no good.. I beg God to pardon me, for I am moved to say this, seeing that I am the last to die of the Conquistadors." When has it ever happened, either in ancient or modern times, that such amazing exploits have been achieved? Over so many climes, across so many seas, over such distances by land, to subdue the unseen and unknown? Whose deeds can be compared with those of Spain? Not even the ancient Greeks and Romans. When I set out to write for the people of today and of the future, about the conquest and discovery that our Spaniards made here in Peru, I could not but reflect that I was dealing with the greatest matters one could possibly write about in all of creation as far as secular history goes. Where have men ever seen the things they have seen here? And to think that God should have permitted something so great to remain hidden from the world for so long in history, unknown to men, and then let it be found, discovered and won all in our own time! The houses are more than two hundred paces in length, and very well built, being surrounded by strong walls, three times the height of a man. The roofs are covered with straw and wood, resting on the walls. The interiors are divided into eight rooms, much better built than any we had seen before. Their walls are of very well cut stones and each lodging is surrounded by its masonry wall with doorways, and has its fountain of water in an open court, conveyed from a distance by pipes, for the supply of the house. In front of the plaza, towards the open country, a stone fortress is connected with it by a staircase leading from the square to the fort. Towards the open country there is another small door, with a narrow staircase, all within the outer wall of the plaza. Above the town, on the mountain side, where the houses commence, there is another fort on a hill, the greater part of which is hewn out of the rock. This is larger than the other, and surrounded by three walls, rising spirally. ^ a b Kenneth J. Andrien (2001). Andean Worlds: Indigenous History, Culture, and Consciousness Under Spanish Rule, 1532-1825. University of New Mexico Press. p. 3. ISBN 978-0-8263-2359-0. The largest of these great imperial states was the Inca Empire or Tawantinsuyu — the empire of the four parts — which extended from its capital in Cusco to include this entire Andean region of 984,000 square kilometers. ^ a b c Means (1932). ^ a b c MacQuarrie (2007). ^ Betanzos et al. (1996). ^ a b c d e Innes (1969). ^ Jolas, Maria (1961). The Royal Commentaries of the Inca Garcilaso de la Vega. Orion Press. ^ Jay O. Sanders. "The Great Inca Rebellion". Retrieved 30 June 2010. ^ Jane Penrose (2005). Slings in the Iron Age. ISBN 978-1-84176-932-5. Retrieved 30 June 2010. ^ Lockhart, James (1993). "Introduction". We People Here: Náhuatl accounts of the Conquest of Mexico. Berkeley: University of California Press. pp. 7–8. ^ Carroll, Chris (July 2007). "Archaeology: Shot by a Conquistador". National Geographic. 212 (1): 18. ^ Koch, Peter O. “The Spanish Conquest of the Inca Empire”, McFarland & Company, Inc., Publishers, Jefferson, North Carolina, and London, 2008. ^ Lockhart, James. Spanish Peru, University of Wisconsin Press. ^ Freeman, David (2014-05-22). "Spanish Conquest Altered Peru's Shoreline, New Research Shows". Huffington Post. Retrieved 2019-01-18. ^ Belknap, Daniel F. and Sandweiss, Daniel H. “Effects of the Spanish Conquest on coastal change in Northwestern Peru”, Proceedings of the National Academy of Sciences of the United States of America, 111: 7986-7989. ^ PringleMay. 19, Heather; 2014; Pm, 3:00 (2014-05-19). "Spanish Conquest May Have Altered Peru's Shoreline". Science | AAAS. Retrieved 2019-01-18. ^ "The Simpsons Archive, Season 20". Archived from the original on 24 November 2009. Retrieved 20 November 2009. ^ Woods, Michael (2001). Conquistadors. London: BBC Worldwide. p. 272. ISBN 978-0-563-55116-4. Bauer, Brian S. (1991). "Pacariqtambo and the Mythical Origins of the Inca". Latin American Antiquity. 2 (1): 7–26. doi:10.2307/971893. JSTOR 971893. Betanzos, Juan de; Hamilton, Roland; Buchanan, Dana (1996). Narrative of the Incas. Austin: University of Texas Press. ISBN 978-0-292-75560-4. Covey, R. Alan (2000). "Inka Administration of the Far South Coast of Peru". Latin American Antiquity. 11 (2): 119–138. doi:10.2307/971851. JSTOR 971851. Gibson, Charles (1978). "Conquest, Capitulation, and Indian Treaties". The American Historical Review. 83 (1): 1–15. doi:10.2307/1865900. JSTOR 1865900. Hemming, John (1970). Conquest of the Incas. New York: Harcourt. ISBN 978-0-15-122560-6. Innes, Hammond (1969). Conquistadors. New York: Alfred A. Knopf. Kubler, George (1945). "The Behavior of Atahualpa, 1531–1533". The Hispanic American Historical Review. 25 (4): 413–427. doi:10.2307/2508231. JSTOR 2508231. Kubler, George (1947). "The Neo-Inca State (1537–1572)". The Hispanic American Historical Review. 27 (2): 189–203. doi:10.2307/2508415. JSTOR 2508415. Lockhart, James. Spanish Peru, 1532-1560 : a social history. Madison, Wis. : University of Wisconsin Press, c1994. Lovell, W. George (1992). "'Heavy Shadows and Black Night': Disease and Depopulation in Colonial Spanish America". Annals of the Association of American Geographers. 82 (3): 426–443. doi:10.1111/j.1467-8306.1992.tb01968.x. Macquarrie, Kim (2007). The Last Days of the Incas. New York: Simon and Schuster. ISBN 978-0-7432-6049-7. Means, Philip A. (1932). Fall of the Inca Empire and the Spanish Rule in Peru, 1530–1780. New York: Scribner. Newson, Linda A. (1985). "Indian Population Patterns in Colonial Spanish America". Latin American Research Review. 20 (3): 41–74. JSTOR 2503469. Seed, Patricia (1991). "'Failing to Marvel': Atahualpa's Encounter with the Word". Latin American Research Review. 26 (1): 7–32. Wachtel, Nathan. The Vision of the Vanquished: The Spanish Conquest of Peru Through Indian Eyes, 1530-1570, translated by Ben and Sid Reynolds. 1977. Ward, Thomas (2018). The Formation of Latin American Nations: From Late Antiquity to Early Modernity. University of Oklahoma Press. ISBN 978-0-8061-6150-1. This page was last edited on 15 April 2019, at 14:45 (UTC).